Robert Gordon (2012) argues that the age of great innovations has passed and that the innovation process has run into diminishing returns, leading to an irreversible slowing of total factor productivity (TFP) growth. Will the future of our economy really be dominated by secular stagnation? And what is behind the recent slowdown in measured productivity growth? These issues raise the more general question of how real output is measured and whether the slowdown could be a mere artefact of real output becoming harder to quantify. In practice, nominal output is relatively straightforward to observe. But nominal output growth must be split into real and inflation components. Hence, bias in measuring productivity growth and bias in measuring inflation are two sides of the same coin. Back in 1996, the Boskin Commission increased awareness of potential biases in how the US Bureau of Labor Statistics accounts for new products in calculating the Consumer Price Index (CPI). In particular, the Commission challenged whether the Bureau of Labor Statistics accurately deals with products experiencing model changes by the same producer (e.g. successive years of a car model) and with completely new product varieties. In a recent paper, we propose a method that deals with new product varieties but also, more importantly, with products that are subject to creative destruction (Aghion et al. 2017). In doing so, we highlight and quantify an additional, overlooked source of bias that has to do with imputation – used by the Bureau of Labor Statistics as well as the statistical offices in most other OECD countries. Creative destruction implies that products exit the market because they are eclipsed by a better product sold by a new producer. Such forced exit is relatively frequent in the US.1 The standard procedure in such cases is to assume that the quality-adjusted inflation rate is the same as for other items in the same category that the statistical office can follow over time, i.e. products that are not subject to creative destruction. However, creative destruction implies that the new products enter the market because they have a lower quality-adjusted price. Our study tries to quantify the bias that arises from relying on imputation to measure US productivity growth in cases of creative destruction. To characterise such missing growth, we develop a theoretical framework in which growth results from both incumbent and entrant innovations. Our model generates an explicit expression for how much TFP growth is missed when the statistical office resorts to imputation in the event of creative destruction. Missing growth is a function of the frequency and size of quality improvements from creative destruction versus other types of innovation (such as improvements incumbents make to their own products). If the statistical office is correct to assume that the quality-adjusted inflation rate is the same for creatively destroyed products as for surviving incumbent products, then the market share of surviving incumbent products should stay constant over time. If instead the market share of these incumbent products shrinks systematically over time, then the surviving subset of products must have higher average inflation than creatively destroyed products. For a given elasticity of substitution between products, the more the market share shrinks for surviving products, the more the missing growth. We apply this framework to establishment-level employment data on all non-farm businesses from the US Census to quantify missing growth in the US economy over the last three decades, shown in Figure 1. We identify surviving incumbent products with surviving plants. We estimate that missing growth averaged 0.62% per year from 1983 to 2013. We see no clear time trend in this bias. In Figure 1 we also add measured productivity growth by the BLS to our estimate of missing growth to arrive at ‘true growth’.2 Missing growth amounts to roughly one-quarter of true growth on average. 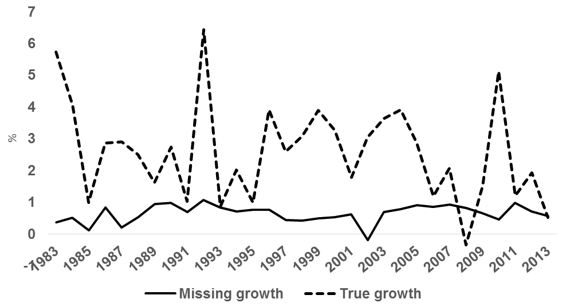 Furthermore, since missing growth is fairly stable over time, TFP growth still appears to have slowed in recent years. Using our market share method, we can also look at missing growth across sectors. The results imply that the majority of aggregate missing growth comes from retail and service industries (e.g. health care), rather than manufacturing. As an independent check on our results, we provide a second quantification that relies on an algorithm by Garcia-Macia et al. (2016) to estimate the arrival rates and step sizes of the various types of innovation. The algorithm matches moments of job creation and destruction at the firm level. We run this estimation for the two periods, 1976-1986 and 2003-2013. We then use estimates of the arrival rates and step sizes in our accounting framework to quantify missing growth. This method is less intuitive than our first approach, but it allows us to decompose the bias into that resulting from creative destruction versus variety expansion. Using this second method we arrive at two results, illustrated in Figure 2. First, we find that missing growth is not dramatically different from what we found using the first (market share) approach: 0.52% per year (versus 0.46%) over 1983-1986, and 0.42% (versus 0.76%) over 2003-2013. 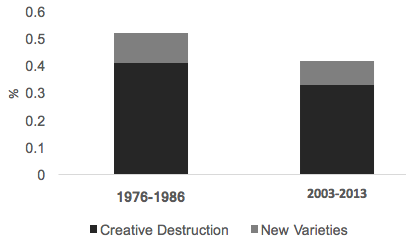 Second, we find that the clear majority of the missing growth is due to creative destruction: 0.41% per year from creative destruction (versus 0.52% total) over 1976-1986, and 0.33% per year from creative destruction (versus 0.42% total) over 2003-2013. Since we find no clear time trend in missing growth, the bias we quantify here cannot account for the measured slowdown in productivity growth. Why then should we care about the fairly constant missing growth of about 0.5% per year? Our main finding has a number of practical implications. First, it suggests ways statistical offices might improve their methodology. Second, factoring in missing growth, ideas are not becoming as hard to find as official statistics suggest. This has implications for the production of ideas and future growth as well as optimal growth policy. Third, the US Federal Reserve might consider adjusting its inflation target upward to get closer to achieving quality-adjusted price stability. Fourth, as stressed by the Boskin Commission, because US tax brackets and Social Security benefits are indexed to measured inflation, they would evolve differently if official inflation was lowered by 0.5% per year. Finally, although 0.5% per year looks small, over 30 years it accumulates to mean that a higher fraction of children enjoys a better quality of life than their parents (see Chetty et al. 2017). Authors’ note: The views expressed do not necessarily reflect the views of the Federal Reserve Bank of San Francisco, the Board of Governors of the Federal Reserve System. All results have been reviewed to ensure that no confidential information from the US Census Bureau or US Bureau of Labor Statistics have been disclosed. Aghion, P, A Bergeaud, T Boppart, P J Klenow, and H Li (2017), “Missing Growth from Creative Destruction”, unpublished paper. Boskin, M, R J Gordon, E Dullberger, Z Grilliches, and D Jorgenson (1996), “Toward a More Accurate Measure of the Cost of Living”, Final Report of the Senate Finance Committee from the Advisory Commission to Study the Consumer Price Index. Chetty, R, D Grusky, M Hell, N Hendren, R Manduca, and J Narang (2017), “The Fading American Dream: Trends in Absolute Income Mobility since 1940”, Science, 356 (6336), 398-406. Garcia-Macia, D, C-T Hsieh, and P J Klenow (2016), “How Destructive is Innovation?”, NBER Working Papers 22953. Gordon, R J (2012), “Is U.S. Economic Growth Over? Faltering Innovation Confronts the Six Headwinds”, NBER Working Papers 18315. Klenow, P J, and O Kryvtsov (2008), “State-dependent or Time-dependent Pricing: Does it Matter for Recent U.S. Inflation?”, Quarterly Journal of Economics, 123 (3), 863-904. The annual exit rate of products was 22.5% in the CPI from 1988 to 2004 (Klenow and Kryvtsov 2008). We take the BLS multifactor productivity growth expressed in labor-augmenting units and add back their estimate of the contribution of R&D and intellectual property to arrive at the measured series.